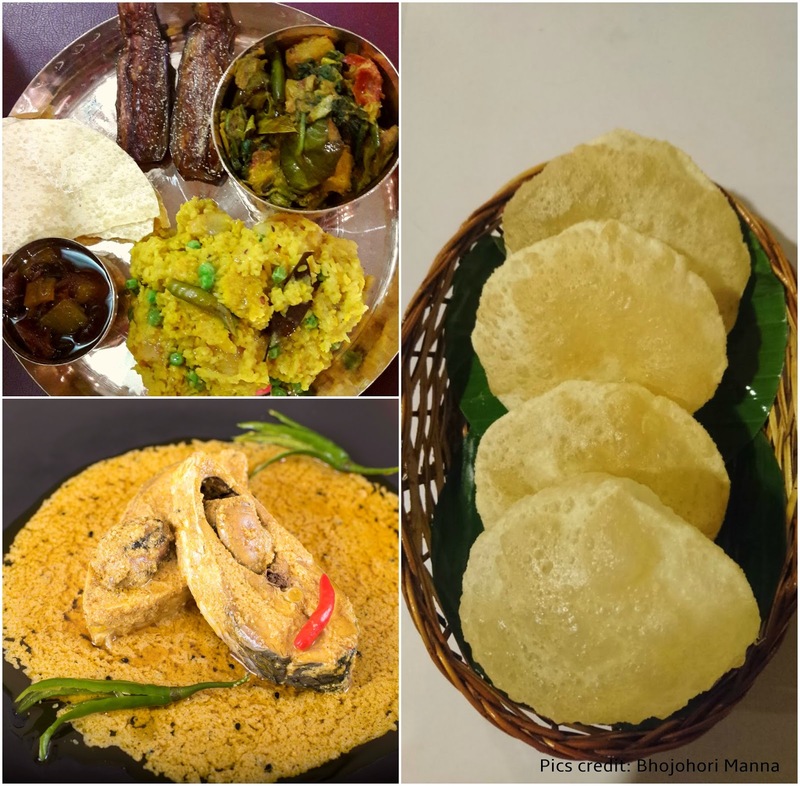 It’s a rare Bengali breakfast that would be complete without the Phulko Luchi, the Eastern counterpart of the Puri, especially around Durga Puja . Made with refined flour, it’s slightly smaller than the normal puris and popularly served with either sweet or savoury sides, the more common ones being Alur Torkari or Cholar Dal. The taste of a true luchi is enhanced when fried in ghee. That might have got your calorie bells ringing, but remember, Pujo time is for indulgence! Radha Ballabhi is a match made in culinary heaven. It’s one of the omnipresent dishes in any important Bengali ceremony. It’s difficult to pass by a sweet shop and resist these stuffed delights, right off the wok as they are prepared by the Moira, or the traditional sweet maker. Much as they are a popular breakfast dish, they are equally enjoyed as evening snacks. Other snacks worth exploring at this time are the Koraishutir (Peas) Kochuri with Alu dum, the humble Alu chorchori seasoned with Hing and Golmorich (asafetida and pepper) and the Tinkona (triangular) Porota with Chenchki (vegetables or lentils spiced with panchphoran), Vegetable chop, Kathi rolls and Dimer Devil, which is, guess what – Deviled Egg! The Bhog or the community lunch is the highlight of the Pujo celebrations. It is Niramish or pure vegetarian. Bhog er Khichuri or Moong dal Khichdi is an important part of the bhog. Prepared in the Satvik manner, i.e, no onion or garlic and just the fact that it’s cooked for Bhog, it’s blessed with a flavour that can rarely be recreated elsewhere. Other dishes include the Mishti pulao, Labdar Torkari, a mixed vegetable dish, Chanchra (a drier vegetable dish); all this served with crispy fried bhajas or vegetable fritters on the side and the delectable Payesh and mishti to end the meal with. It’s interesting that typically, a sweet and sour chutney is served in the interim before the dessert fare to cleanse and neutralize the palate. From the Muri Ghonto or the Fish head curry served with rice, Ilish Pulao, the famous Kolkata mutton biryani, to Shukto, Doi Fulkopi (spicy cauliflower in yogurt), Lal Shaak bhaja (you guessed it right, amaranth fritters) and an interesting one made with grated potato, called the Jhiri jhiri or Jhuri Alu bhaja, there's a heady mix for vegetarians and meat lovers alike..
No account of Bengali culinary offerings is complete without touching the sweet end of the spectrum. The Nolen gurer Mishti Doi or sweetened yogurt made with date palm jaggery and Nolen gurer Payesh are major attractions. Bijoya or Dashami sees more sweets, as togetherness is celebrated with sweets; Mishti mukh kora as it’s called. Komola Bhog, a saffron flavoured Roshogullah, Sandesh in all its variations, also Shor Bhaja, a sweet that’s deep fried in ghee and soaked in sugar syrup. This dish originated in Krishna Nagar, Nadia and is a labour of love. It’s made from the cream of milk called Shor. A baked variation of this dish also exists, called Sarpuria. 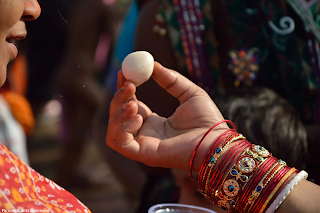 The connection of food with the Divine is oft talked about and is a given. It’s indeed the power of faith, purity of mind and the spirit of cooking and eating together that infuses a magical flavour to any fare. 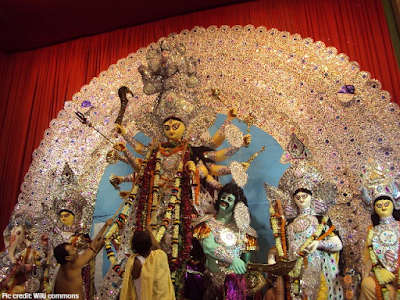 So this Durga Pujo, go ahead and celebrate the festival of power or Shakti, victory of good over evil and discover the power of food in all its glory.